I haven’t been writing for quite some time. Thought I should pen down some of my thoughts. Note: I have my reservation about Ross Stores Inc despite its good financial performance, as it operates off-price retail apparel and home fashion stores. With the prevalence of online shopping and relatively weak moat typical of low cost retailers eg. low barriers to entry, intense pricing competition, lack of strong brand (read here) it requires more intensive study. More ‘commodity’ than franchise perhaps. If there is a company which I can perpetually not worry about, that would be Mastercard. However before I go on: The market has dropped, but I feel that it is not the great sale yet. The P/E for Mastercard is still high. Therein lies the frustration. We have been through “Black Monday”, and subsequently market has recovered slightly, but there is still this anticipation of further drop. So it is the holding back and wait period (it is like the dark clouds are forming, you get a drizzle then stops. Instead what you get most of the time now is haze + hot, humid and sticky weather…. not a thunder storm nor rainbow after the rain). I do not think I will go all in and buy any of the listed companies shown above. However, while surfing they did caught my eye. And I do hope that their valuation will become much more attractive. Visa and Mastercard technically have a priceless business model (read here). It deals with the very essence of Capitalism – everytime anyone pays via the credit or debit card, he/she is highly likely going to credit Visa or Mastercard (like finding the Holy Grail of Earnings – be it only a mere fraction of a cent). In fact, Visa and Mastercard are in a well-protected oligopoly. The set up cost for any competitors would be high (their nearest competitors are small in comparison eg. American Express and Discover). Among Visa and Mastercard, Visa is the bigger company. Unlike Discover and American Express, Visa and MasterCard don’t actually issue any credit cards. All Visa and MasterCard branded credit and debit cards are issued by individual banks. In many ways, the fundamentals of Visa and Mastercard are quite close. Valuation wise, their P/E, PEG and EV/EBITDA are close. MasterCard’s stock is arguably more attractive than Visa’s stock if we are talking long-term, based on a few recent events. Many are bullish on MasterCard due to its equity buyback program which takes place normally during Q4 or January. 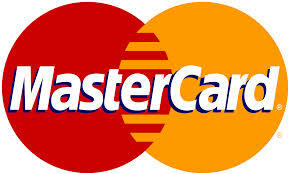 MasterCard has also upped its dividend before the stock split, showing that the company is committed to shareholders. On the other hand, Visa maintains a larger stock buyback program, about $5 billion according to CNBC…. Both companies have a great forward P/E ratio compared to the industry’s average of -95.20. Both companies are very similar and almost mimic each other in terms of movement related to the market. If the economy improves, both of them benefit, and vice versa if the economy falls. Investors should keep an eye out for acquisitions/mergers, or electronic payments deals with companies like Samsung, Apple (AAPL), Amazon (AMZN), that may give one stock an edge over the other. After the stock split, Visa seems to be very slightly better to invest in for the short term, as it has recently witnessed a major pullback after the earnings report during last quarter’s conference call, which it still has not fully recovered from. All in all, both stocks are excellent for long-term investors. Pristine Balance sheet. Visa has no debt. It has a total cash value of USD 4.72B. Current Ratio is at 1.74. In comparison, Mastercard has a total debt of USD1.5B and total cash value of USD5.08B. If you deduct the debt from the cash value, there would be USD3.58B cash. Although Profitability wise, the profit margin and operating margin of Visa is higher. However Mastercard has higher ROA and ROE. If we study the historical profitability performance of Visa and Mastercard, Mastercard consistently beat Visa in the ROA, ROE and ROIC by a huge margin. 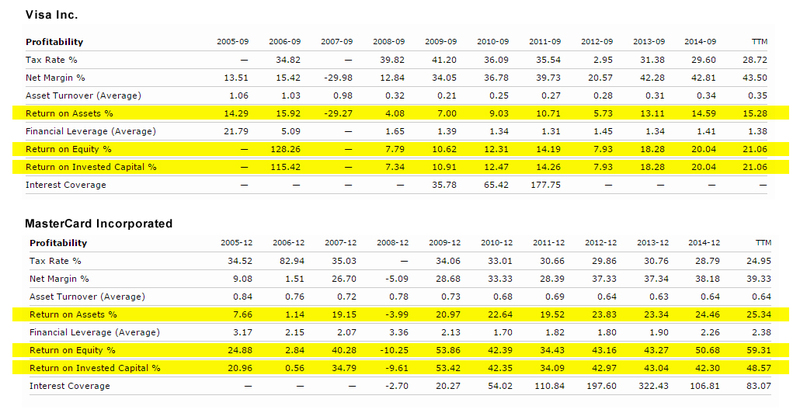 Even with the debt (of Mastercard), the good ROIC by Mastercard is worth noting. 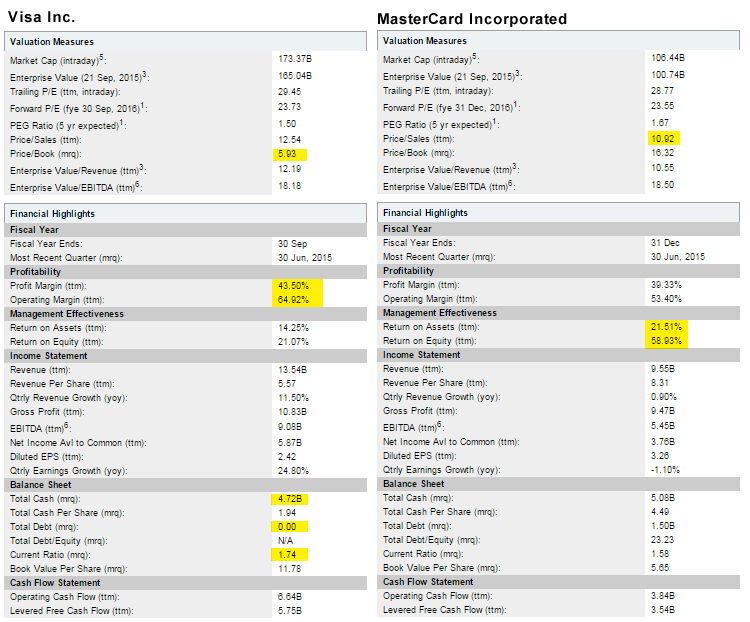 Nevertheless, the differences between Visa and Mastercard is not that huge. Both have huge wide business moats. This entry was posted in Mastercard, US Stocks. Bookmark the permalink. 5 Responses to There are some things money can’t buy. For everything else, there’s MasterCard. Thank you T. for this comprehensive analysis. I tend to favor MA as well and got it on my watchlist for quite some time already. Watching it going up from 75 USD to 90+ USD. Somewhere below 90 USD is a good entry point for me.